I've always thought IOU meant just what it means: "I owe you." Here is what I think of as Moriarty's clear visual statement: IOU on black raptor's wings. The Moriarty coat of arms is a black raptor on a silver field. He says it so many ways, "This is between you and me, Sherlock." It's personal. There's a complete theory here: Holmes/Moriarty Connnection. Moriarty has been after Sherlock since S1E1 and Sherlock "had no idea" what Moriarty meant. "In any case, Sherlock must not be shot. He must be one of the suicides. Moriarty wanted more than his death, only Sherlock's defeat would earn the final payment. The words from the cabbie's mouth are Moriarty's, the method to entice him, appeal to both his ego and his inherent reckless disregard for his own safety. He'll risk not breathing for the sake of "brain-work" because "breathing is boring." Starting at the beginning, why did that cabbie seek out Sherlock at all, much less at his flat? He had no reason to think Sherlock would find him, he drove away after Sherlock dismissed him. Yet, he put himself at risk, trying to conquer and kill Sherlock Holmes in a way which would humiliate him in memory and invalidate his reputation. The great Sherlock Holmes would fall victim to a funny little man driving a cab. It foreshadows "The Reichenbach Fall", where Sherlock "will die in disgrace." Of course, that's the point of this, James tells him. 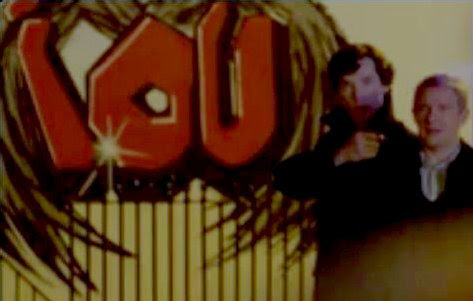 And if the words in the cabbie's mouth are Moriarty's, it's a very small leap to that cabbie actually being Moriarty. Recall what Sherlock said to him, "Either way, you're wasted as a cabbie." True. Because he wasn't a cabbie at all. Moriarty. So much more than just a man. What's more than a man? A family. A clan. The Killer Cabbie may have been a man with an aneurism, he also is easily cast as the senior Moriarty, a proper genius, father to James, the original "Professor Moriarty," intent on destroying the son of Holmes senior, his enemy. Moriarty plays the role of the "funny little man driving a cab" well, right down to the shaving foam on his neck. Why? Always the question for Moriarty in any form: why are you doing this? What's it all for? Recall Gatiss in the commentary hints at Sherlock's father possibly having an affair. Even without that, something really upset the hell out of Mummy. Who did Holmes Senior possibly run off with? The only woman we've seen who makes a good candidate is the one torn from the picture of the Killer Cabbie's children. Was it an affair? Or did Holmes Senior disappear with her to rescue her and her children from a psychopathic husband and father who helped one of his children murder another child? Who would have put Holmes Senior onto the crime? Sherlock, the boy genius who knew Carl Powers' shoes would have been with his clothes. Sherlock said, "I made a fuss, I tried to get the police interested, but nobody seemed to think it was important." Perhaps his father listened to him more carefully than he knew. 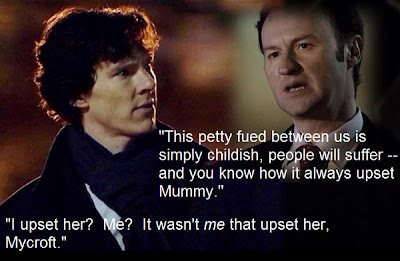 Mycroft somehow blames Sherlock for whatever happened, for what made him have to assume an adult's role at home and "play mother" to Sherlock. Even assuming the senior Holmes didn't share his investigation of the Carl Powers case with his son, it's easy to imagine the hyper-astute Sherlock noting behavior patterns and physical evidence that would lead him to perhaps blurt out that his father was keeping company with another woman. If Holmes senior left, it could have led to the breakdown of his wife, or even her suicide. If Mycroft blames Sherlock for being the catalyst that started the reactions leading to the breakdown of the family, Moriarty senior and the child psychopath James, the boy taken from his father's side, surely also blame him. It was personal from the very beginning. Where would James, as a child, obtain C. botulinum bacteria? Depends on what kind of "professor" his father was. It really does sound plausible. Since this discussion seemed to be developing a life of its own, I have given it its own thread. Julia Mae, if you don't care for the title I gave it, you can change it at any time by editing your initial post. I think you and the title are perfect, such a good idea so that our other OP can explore her ideas without everything getting tangled up. Thank you for going to so much work. Hey, maybe you should think about just deleting my big long post from that thread to keep it nice for the OP. Wait. Maybe I still can..... oh you did already. Excellent. I couldn't delete my last response, they let me hide it, though. IF we were to agree that something must have happened in the past, I'd be really interested in some other ideas that take into account the time frame and the Carl Powers murder. Problem is, Gatiss really loves backstory and Moffat really doesn't and we might never get back there. I am surprised it even sounds comprehensible, as I scavenged it from a much longer post. I have been accused on more than one occasion of thinking too much. ... maybe you should think about just deleting my big long post from that thread to keep it nice for the OP. Wait. Maybe I still can..... oh you did already. Excellent. I couldn't delete my last response, they let me hide it, though. Yes, we were posting in tandem. Sorta. Oh no. The gist of it is clear. I had no problem following the main thought. A woman asks the very question I would ask: How many Moriartys can there be? "James" is never called "Professor." It sounds to me like they are saying there was only one Moriarty and he is dead. This would, of course, fly a bit in the face of the Canon, where he has a brother. It's only a minute of interview if anyone wants to take a look. Interestingly, Gatiss speaks about things in early drafts of The Great Game where Moriarty's schoolyard nickname is "Prof." And what Carl Powers makes fun of that gets him killed. Whooooaaaaa, confusing!!! Very confusing. Entirely possible, though, I think. Since "Jim" is the Moriarty who was involved in Sherlock's "Reichenbach fall," I've always taken him to be this adaptation's counterpart to the canon's Professor Moriarty -- which does leave the Colonel as a future option, regardless of what Moftiss are currently thinking (or saying). Will definitely have to play that video, though! I have no idea why Moriarty is so fixated on Sherlock (apart from the fact that Sherlock seems to be his first "worthy" opponent, which must of course be exciting, but then, the same could be said for Mycroft, and Moriarty doesn't seem to have a particular "thing" about him). All we know is that they go pretty far back. Moriarty, it turns out, killed Carl Powers, and Sherlock regards this as the case where he "began". It is very unlikely a coincidence that Moriarty chooses Carl's story to get the game with Sherlock going. He must have known, or found out later when he was researching Sherlock, that this story had a personal significance to his opponent. Now, if Moriarty would turn out to be "the other one" (or to have been, which I would much prefer), then of course there'd be a whole other multitude of possibilities. I don't think this is the solution, but I must admit I still really like the idea. It only works as a theory though if one assumes Sherlock does not know he has another brother at all, or thinks the "other one" is dead. There certainly have been no hints whatsoever that he thinks Moriarty might be related to him. Moriarty creeps me out. He seems very unreal, as if he truly did come straight from the realm of fairy tales, and not the kind I'd like as a bedtime story. If John hadn't seen him being his crazy self at the pool, I would suspect they'd gone with the theory that Moriarty is a (perhaps drug-induced) figment of Holmes' imagination. Maybe Sherlock thinks there's only two Holmes brothers, and only two. If that's true, then you can't assume that he thinks there's an other one, dead or alive. And if Moriarty is the other one, and Sherlock doesn't know it, then we could infer that Sherlock's either under selective amnesia or he blocked out all memories of Moriarty being his brother. I always thought MoriarT zoomed in on S because S is the one who kept messing about in his business. The cabbie & Gen'l Shan being the latest such examples. He didn't bother with Mycroft because Myc didn't bother with him ("he seems desperate to get my attention" -- implying that the attention was still to be gotten.....) Myc seems to be focused on loftier things than mere criminals. I don't think Mycroft would be interesting enough for Moriarty. He's too buttoned up, too stiff, too controlled. You can't push his buttons the way you can Sherlock. Sherlock has an element of unpredictability to him that I would think Mycroft would find interesting. Right, he's fascinated by Sherlock because he thinks they're somehow the same -- ?? And vice versa. Sherlock told John that he had tried to raise a fuss over Carl's missing shoes, but no one would listen. Perhaps Moriarty heard about it, though, and that's when he first decided that Sherlock was his enemy. Regarding the video -- the first three minutes are just musical filler. The question that Julia Mae mentioned occurs at about 39 minutes in. The early-draft bit that she mentioned Gatiss referring to is that Carl Powers had laughed at Moriarty's asteroid theory (which is a reference to one of the canon Professor's writings). And one of the other questioners is wearing the same tee-shirt I have (a heart-shaped section of The Wallpaper with the yellow smiley superimposed). When Sue Vertue compliments her on the shirt, she says that she made it. So she's the gal who designed my shirt -- cool! Are you sure that Moriarty hold a grudge against Sherlock? It could be simply because out of the two Holmes brothers, Sherlock is the capricious one and thus more enjoyable to play with than his boring older sibling. :P A game with Sherlock will afford Moriarty with more audience in literal sense and appeal to his inner showmanship compared with silent, behind the screen war that surely would occur should he target Mycroft directly. Moriarty is one of the most complex characters in the series. He was not Sherlock on the side of the devils nor he was a cruel machine with tendency for showing off. It is a real pleasure to try to get a peek into his mind. Well, the "IOU" messages imply some kind of grudge. But I agree, in some sense Jim just wanted to "play" with Sherlock because it was fun to do so. And because Sherlock took the bait and played back. The voice in my ear ... told me to say some stuff - which, I realised, gave the impression that I was behind it all. That I, John Watson, was Moriarty. I could see the look in Sherlock's eyes - a flash of, not anger, but hurt. For a second, he looked like a little, lost child. So is the last repeat of the IOU motif a nod to this statement in John's blog? Or is it something more? Probably used as recurrent theme but with different meanings. I.O.U generally mean an acknowledgement of debt but what if according to Jim's mind (someone who is not exactly a devoted follower of societal conventions) it also can stand for, "I Own U / You Are Mine"?